The Italian salad repertoire features many that possess an assertively bitter flavour profile, and this is one of our favourite examples. Despite its scant list of ingredients, it packs a wallop of flavour. The sharp and salty nature of a well-aged artisanal caciocavallo from Sicily is a league apart from that of even the finest caciocavallo from Calabria or anywhere else on the mainland, so do make the effort to find one. 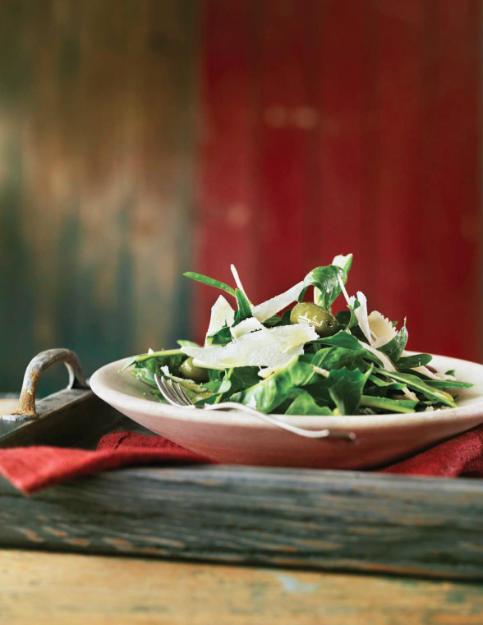 In a salad bowl, combine the dandelion, radicchio, parsley, and olives. Toss. Add vinegar, oil, and salt and pepper, and toss again. Taste and correct seasonings. Shave half the caciocavallo over the salad, and serve with the extra cheese on the side. 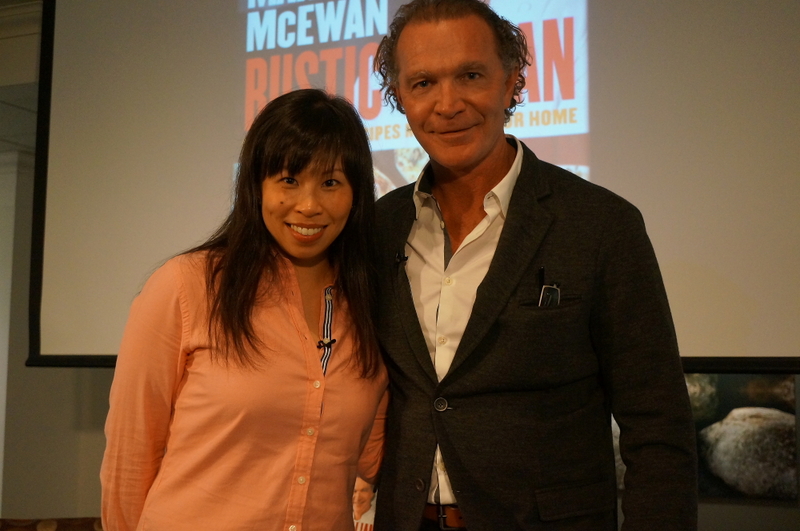 On November 27, Chef and Author, Mark McEwan sat down with television and radio host, blogger, and food columnist, Pay Chen, to chat Top Chef gossip, entertaining tips, the Canadian grocery scene, keeping the business fresh, and of course, Penguin Group Canada’s new release, Rustic Italian: Great Italian Recipes Made Easy for Home. 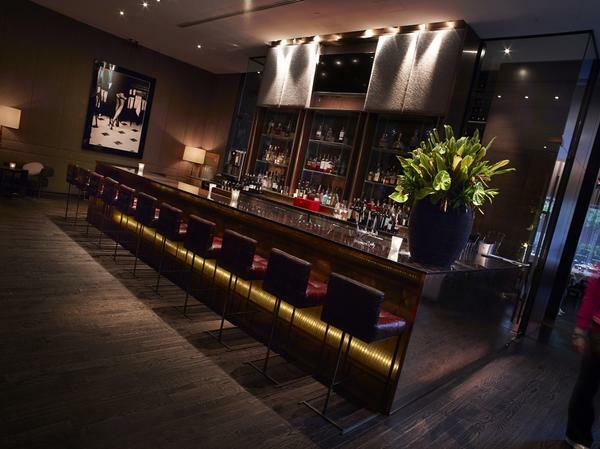 Mark describes himself as wanting to be Italian in his next life, so it was no surprise when he opened the Italian restaurant, Fabbrica in 2010. Since starting in the food business years prior, in 1985, Mark has been reading, tasting and observing fantastic Italian dishes abroad and at home, and has funneled those lessons into Fabbrica’s authentic Italian menu. While not Italian himself, apparently he’s done a pretty fantastic job playing the part judging by the hoards of happy Nonnas from Woodbridge who consistently give him the nod of approval. “That’s the litmus test- it doesn’t get better than that,” Mark said. 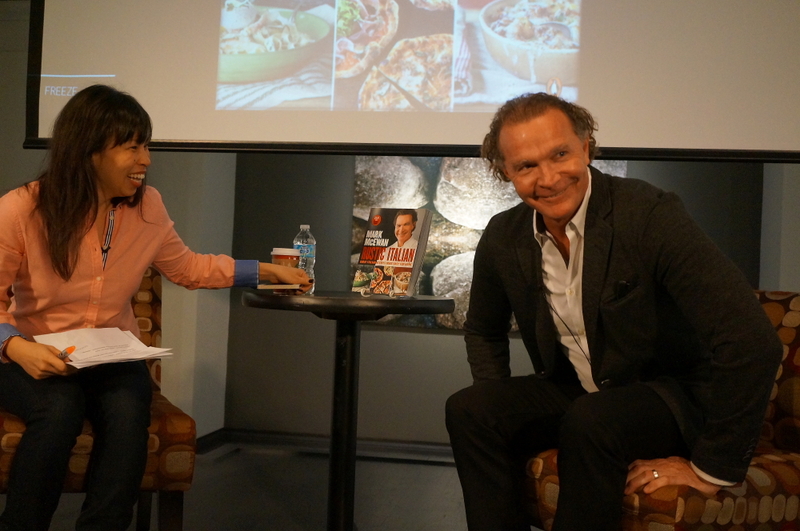 With the cookbook, Mark has made his restaurant quality Italian dishes accessible to the home cook, whether for a weeknight family meal or an elegant dinner party for 12. When it comes to entertaining, Mark warned audience members not to stretch themselves too thin. So rather than locking ourselves in the kitchen with plans for an elaborate 10 course meal (hey, we’ve all done it), he suggests we get all the components ready and assign family and friends to different tasks in the kitchen. Who cares if Uncle Jerry’s gnocchi are all different sizes, or your little niece overworks the bread. The point is you actually got to spend time with your guests. And with the holidays behind us, and we start pondering our new years resolutions, maybe it’s time we take a tip from the chef and rethink our grocery shopping habits. For Mark, the most important determinant when grocery shopping should always be quality, the reason why he’s personally sourced the best quality ingredients for his restaurants and grocery store, McEwan. In comparison to 20 years ago, “Canada has made leaps and bounds” in what’s been locally produced and available in the market – Mark says you just need to check out the remarkable local cheese selection at his store to see that! 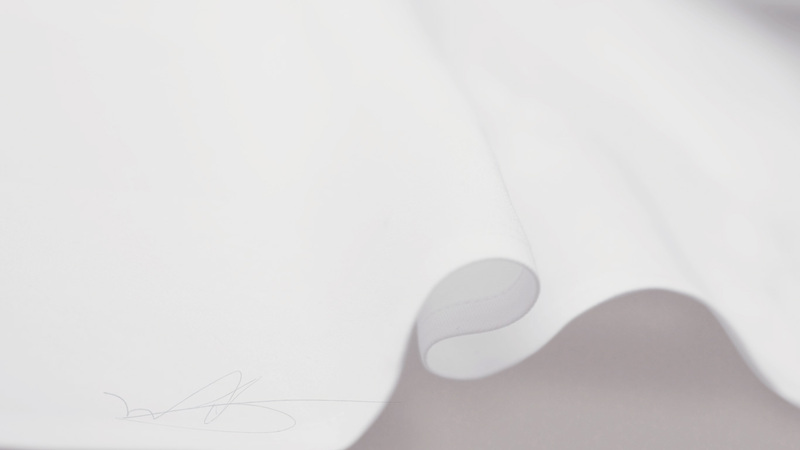 And while buying quality is one hurtle, maintaining it and not letting it go to waste is a whole other concern. And speaking of freshness, for a man owning some of the longest-running restaurants in the city, Mark certainly knows how to keep things exciting. How does he manage to keep his business fresh despite not always being the “new restaurant” in town? “Challenge yourself” he says, because “the moment you take your foot off the accelerator you can feel the draft.” Right now, for example, Mark is undertaking a physical and conceptual facelift in his financial district restaurant, Bymark, with a menu of more fun, playful new dishes coming out and an interior design to match! 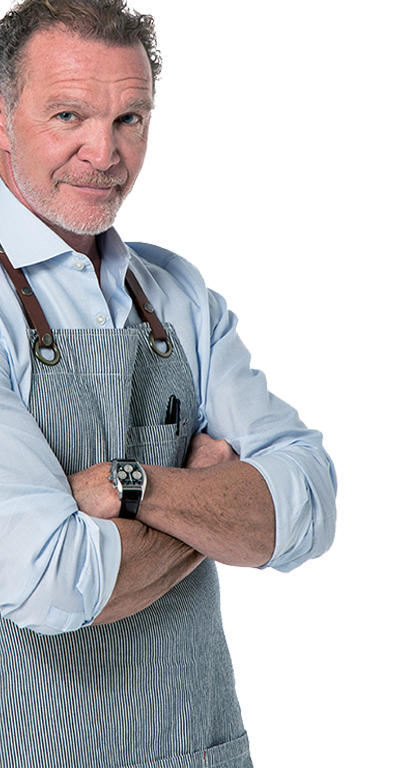 Mark also finds inspiration through his work as Head Judge on the hit Food Network show, Top Chef Canada, where up and coming Canadian chefs bring their A game for the title and prize. 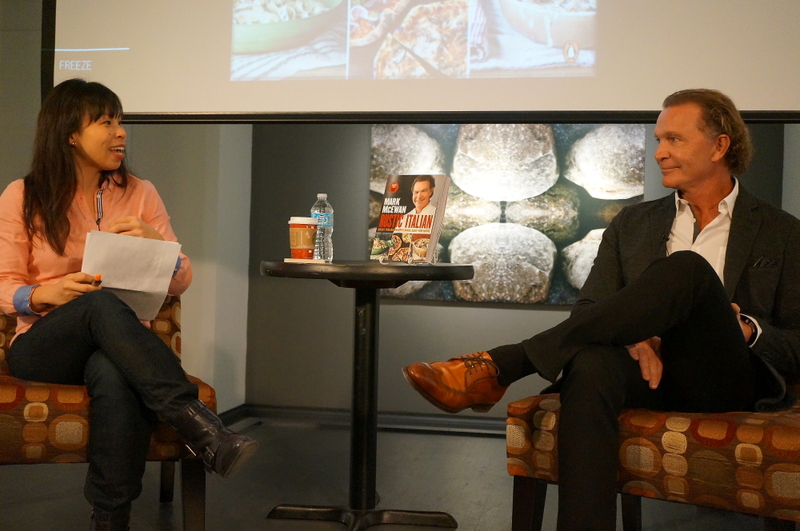 With so many impressive and inventive young food entrepreneurs, it’s no surprise Mark feels the need to “look in the rear view mirror” from time to time. It’s clearly a very exciting time for Canadians who love good food. 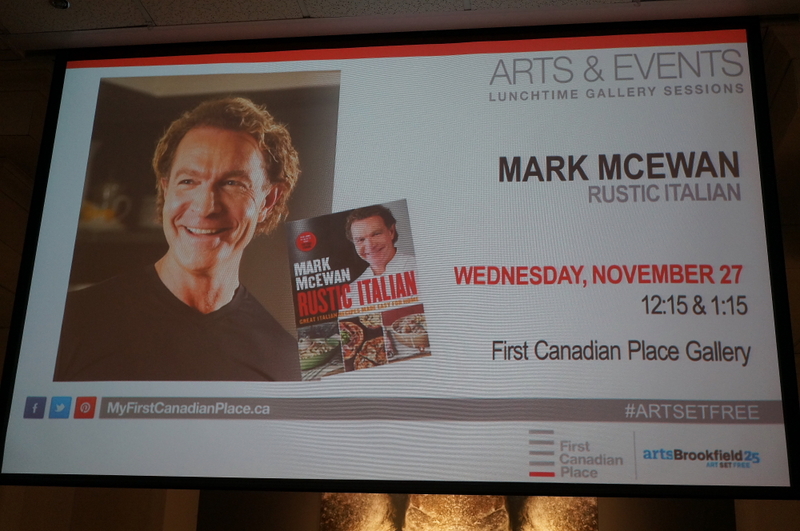 And if you’re one of those food-loving folk, Canadian or otherwise, you’re going to want to get your hands on a copy of Rustic Italian. Available online or in stores for only $26 CAD plus tax, this would make a perfect gift for any aspiring chef or foodie. So grab a copy, a few friends, and like Mark suggests, get everyone in the kitchen helping out. Not only will the meal live up to Mark and your high quality standards, but the memories made in the process will be worth much more.